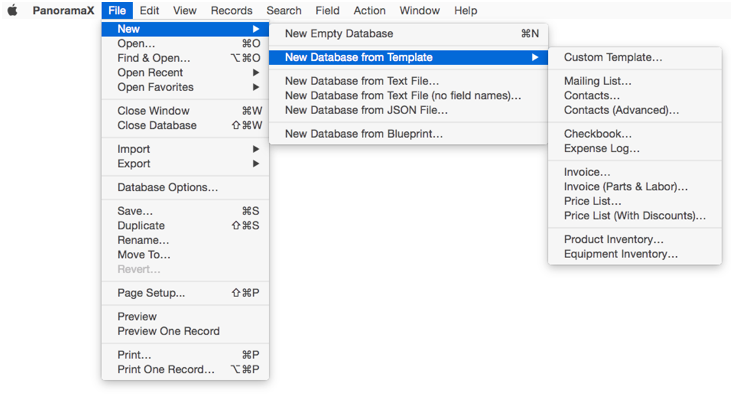 To create a new database, use the File>New menu. The simplest way to create a new database is to choose File>New>New Empty Database or just press Command-N. This creates a new database with a single field named A. Once the new database is created you can manually add the fields you need. See Adding New Fields and Field Properties Panel. Panorama can build some of the most common databases for you automatically, including mailing lists, contact databases, checkbooks, inventory, etc. When you choose a template, Panorama creates an empty new database, then displays a dialog with the template. The template contains a list of fields to be created. Here is the template for a mailing list database. As shown in the example above, you can add tags to customize different fields, like the <money> tag used on the Donation field. To learn more about these tags see the Construct Multiple Fields page. You can also start with a completely blank template (File>New Database From Template>Custom Template), and just type in the list of fields yourself. This can be a quick way to set up new fields in a hurry. As a bonus, Panorama will automatically set up the necessary attributes for common fields like name, address, amount, etc., including the width, data type, capitalization, etc. To create a new database from a text file, you need to start with a tab or comma delimited text file, as shown below. The first line of the file should contain the field names for the data (see below if your text file doesn’t have this). Note: Panorama X only understands text files with valid extensions like .csv, .tsv, or .txt. To create a new database from a text file like this, start by choosing File>New>New Database from Text File, then use the selection dialog to locate and choose the file. Then press the New Database button and voila! you’ve got a new database. If your text file doesn’t have field names on the first line, use the File>New>New Database from Text File (no field names) command. This will import the data with generic field names – A, B, C, etc. You’ll have to set up the field names, widths and other properties yourself, see Field Properties Panel. 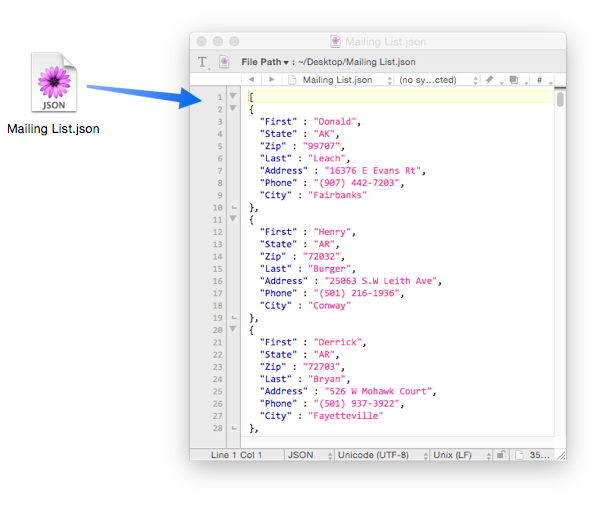 To create a new database from a JSON file, start by choosing File>New>New Database from JSON File, then use the selection dialog to locate and choose the file, then press the New Database button. Panorama will create the database, set up the fields, and import the data. 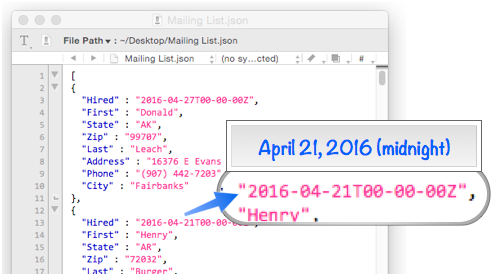 Importing JSON Dates — JSON doesn’t have an official way to encode date information, but many applications use this format to store both date and time information. This example illustrates another point — the order of the fields imported from the JSON data is unpredictable. If it is not the order you want, simply drag the column titles into the correct order (see Rearranging Field Order). Complex JSON Items — In all the examples shown so far the JSON values have been simple fields or numbers. These simple values are straightforward to import into Panorama fields. But JSON values can also be complex values (structures) built up of multiple items. If this type of JSON value is encountered, Panorama will encode the data in a binary field using either a Panorama dictionary or data array. See importjson for more information about this. A database blueprint is a special file that contains a complete specification for the structure of a database, including all fields, forms, and procedures. These blueprints are created with the File>Export>Blueprint command. The File>New>New Database from Blueprint command takes a blueprint specification and turns it into an actual database. This new database has all of the structure of the original database, but no data. To learn more, see Database Blueprints. addfield -- adds a new field to the current database (on the end). addlines -- adds a specified number of records to the end of a database. addrecord -- adds a new record at the end of the current database. arraybuild -- builds an array by scanning a database and creating an array element for every record (including invisible records) in the database (see Text Arrays). arraybuild( -- builds an array by scanning a database and creating an array element for every record (including invisible records) in the database (see Text Arrays). arrayselectedbuild -- builds an array by scanning a database and creating an array element for every visible (selected) record in the database (see Text Arrays). arrayselectedbuild( -- builds an array by scanning a database and creating an array element for every visible (selected) record in the database (see Text Arrays). autoallfieldwidths -- automatically sets the width of all fields based on the data in each field. autofieldwidth -- automatically sets the width of the current field based on the data in it. automaticfieldchoices -- updates the current field's Choice list with actual data in the database. cell -- enters a value into the currently active field (i.e. cell). clearcell -- deletes the contents of the current field. clearrecord -- deletes the currently selected record. closedatabase -- closes a specified database. closefile -- closes the current database. commonfieldspopup -- pops up a list of common fields, and changes the current field specifications when a field is chosen from this menu. 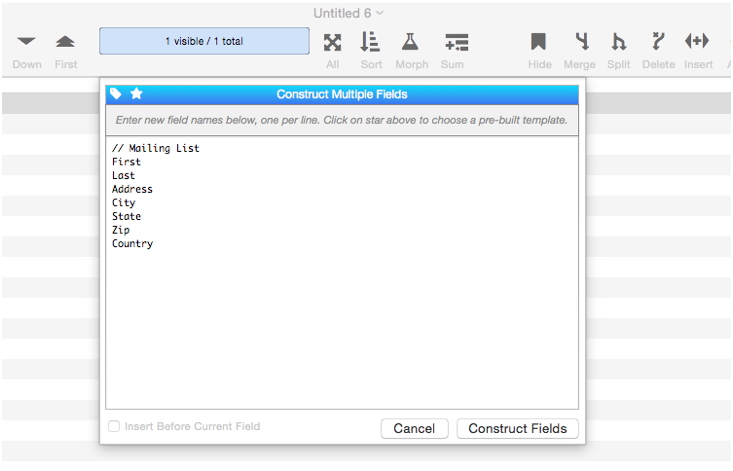 constructfields -- creates one or more new fields based on a template. copycell -- copies the contents of the current field onto the clipboard, replacing anything previously on the clipboard. copyrecord -- copies the contents of the current record onto the clipboard. cutcell -- delete the contents of the current cell and places the deleted data on the clipboard. cutline -- copies the current record to the clipboard and deletes it. cutrecord -- copies the current record to the clipboard and deletes it. databaseexportcsv -- exports selected records in the current database in CSV format (comma separated) to a text file. databaseexportjson -- exports selected records in the current database in JSON format to a text file. databaseexporttsv -- exports selected records in the current database in TSV format (tab separated) to a text file. databaseexportusingformula -- exports selected records in the current database to a text file, using a formula. datatype( -- determines what kind of data is in a field or variable: text, number, etc. datavalue( -- returns the value of a field or variable: text, number, etc. dbcheckopen( -- returns true if the specified database is currently open, false if it is not. deleteabove -- copies the current record to the clipboard and deletes it, then moves to the record above. deletefield -- deletes the current field from the database. deleterecord -- deletes the currently selected record. downrecord -- moves the cursor down one visible record. duplicaterecord -- duplicates the current record. editcell -- opens the edit window for the currently active field (or cell), highlighting the data, and allows you to edit that field. editcellstop -- opens the edit window for the currently active field (or cell), highlighting the data, and allows you to edit that field. emptydatabase( -- returns true if the current database is completely blank. emptyfield -- tells Panorama to move to the next available (empty) field in a series of line item fields. emptyline( -- returns true if the entire current record (all fields) is blank, otherwise it is false. excludefromrecentmenu -- excludes the next opened database from the Recent menu. 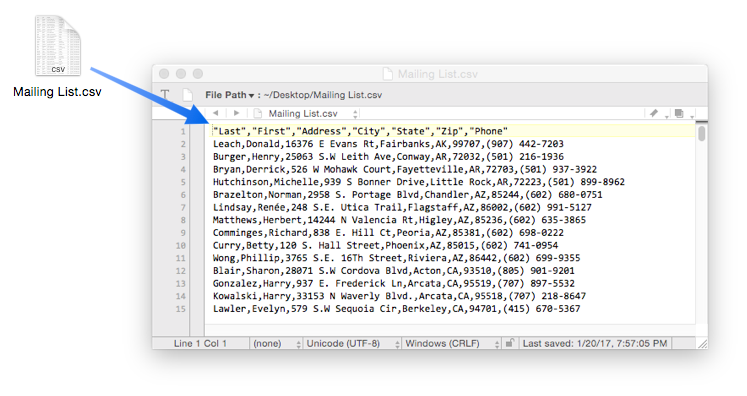 export -- exports the selected rows in the current database into a text file. exportjson -- exports the current database in JSON format. fieldname -- changes the name of the current field. fieldtype -- changes the data type of the current field. fieldvalue( -- grabs the contents of a field in the current record of a database. You can grab data from the current database, or from another database. firstrecord -- makes the first visible (selected) record in the database the active record. formulacalc -- allows you to evaluate a formula that you were not able to code into the procedure when it was being written. formulavalue -- calculates the result of a formula. Usually this is done with an assignment statement (for example `x=2 * y` ), but the *formulavalue* statement gives you more flexibility. You can specify what database is to be used for the calculation (an assignment statement always uses the current database) and you can specify the formula using a variable, making it easy to change on the fly. This statement also gives you more control over how errors are handled. formulavalue( -- calculates the result of a formula based on data in the current record of any open database. This is similar to the fieldvalue( function, but allows any formula to be used, rather than just a single field. getautonumber -- gets returns the automatically generated number for the next record that will be added to the database. getautonumber( -- returns the automatically generated number for the next record that will be added to the database. getproceduretext -- gets the contents (source) of a procedure and places it in a variable. growl -- displays a notification. growlmessage -- displays a notification. importdatabase -- imports data from another database into the current database. importjson -- imports a JSON array into the current database. importjsonline -- imports a JSON record into the current record. importline -- imports a line of text into the current record. importtext -- imports text into an existing database. insertbelow -- inserts a new record below the current record. insertbelowcarriagereturn -- inserts a new record below the current record and moves to the first column. insertfield -- inserts a new field into the database in front of the current field. insertrecord -- inserts a new record above the current record. lastlookupdatabase( -- returns the name of the database referenced in the most recent lookup. lastrecord -- makes the last visible (selected) record in the database the active record. left -- makes the previous field active in the active window. listchoices( -- builds a text array containing a list of all the values stored in a specified field. lookup( -- searches a database for a value, then returns other information from the same record. For example, the *lookup(* function can look up a phone number given a customer name, or look up a price given a part number. lookupall( -- builds a text array containing one item for every record in the target database where the data in the keyField matches the keyData. Each item in the text array contains the value extracted from the dataField for that record. If the data field is a numeric or date field, it is converted to text using the default patterns for that field. lookupalldouble( -- is similar to the lookupall( function, but it returns two fields from the target database instead of just one. lookupalloctet( -- is similar to the lookupall( function, but it returns eight fields from the target database instead of just one. lookupallquadruple( -- is similar to the *lookupall(* function, but it returns four fields from the target database instead of just one. lookupallquintuplet( -- is similar to the *lookupall(* function, but it returns five fields from the target database instead of just one. lookupallseptuplet( -- is similar to the lookupall( function, but it returns seven fields from the target database instead of just one. lookupallsextet( -- is similar to the lookupall( function, but it returns six fields from the target database instead of just one. lookupalltriple( -- is similar to the lookupall( function, but it returns three fields from the target database instead of just one. lookuplast( -- searches the selected records in a database for a value, then returns other information from the same record. For example, the * lookuplast(* function can look up a phone number given a customer name, or look up a price given a part number. Unlike the lookup( function which searches from the top of the database, the *lookuplast(* function searches backwards from the bottom. lookuplastselected( -- searches the selected records in a database for a value, then returns other information from the same record. For example, the *lookuplastselected(* function can look up a phone number given a customer name, or look up a price given a part number. Unlike the lookupselected( function which searches from the top of the database, the *lookuplastselected(* function searches backwards from the bottom. lookupmoredata( -- looks up an additional data field based on the previous lookup. lookupmoreformula( -- looks up additional data based on a previous lookup. lookupselected( -- searches the selected records in a database for a value, then returns other information from the same record. For example, the *lookupselected(* function can look up a phone number given a customer name, or look up a price given a part number. movefieldbefore -- moves the current field to a new position. moverecorddown -- moves the current record down one line. moverecordup -- moves the current record up one line. newdatabase -- creates a new database. newdatabasewithfields -- creates a new database with one or more fields. newdatabasewithjson -- creates a new database using a JSON file. newdatabasewithtemplate -- creates a new database with a template. newdatabasewithtextfieldnames -- creates a new database from a text file. The text file must contain the field names in the first line. opendatabase -- opens a database file. openfile -- opens a database file. It can also import data from a text file, another database, or a variable into the current database. openplain -- opens a database without opening any pre-saved windows, just the data sheet. opensecret -- opens a database invisibly, without opening its windows. opentextfile -- imports data from a text file or a variable into the current database. pastecell -- pastes the contents of the clipboard into the current cell. pasteline -- inserts a new record containing the contents of the clipboard. pasterecord -- inserts a new record containing the contents of the clipboard. recalculatefield -- recalculates all values in current field based on field's formula (selected records only). recompile -- recompiles all procedures in a database. right -- moves the cursor to the next field in the active window. runfieldcalculations -- performs any automatic calculations associated with the current field. runfieldcode -- runs the automatic code associated with the specified field. runfieldsideeffects -- performs any side effects associated with the current field (calculations, procedures, etc.). saveblueprint -- save a blueprint of a database's structure. setactivedatabase -- makes a database active (without changing the configuration of the windows). setautonumber -- changes the automatically generated number for the next record that will be added to database. This allows you to generate numbers out of sequence, or to start the sequence at a specific value. setfieldnames -- changes the names of all database fields at once. setfieldproperties -- modifies one or more properties (name, data type, formula, etc.) of the current field. sizeof( -- calculates the amount of memory used by a field or a variable. superarraybuild -- scans a database to create a text array. This statement is is similar to arraybuild, but with a number of additional options (see Text Arrays). superlookup( -- searches a database for a record that matches a query formula, then uses a second formula to return other information from the same record. This is similar to the lookup( function, but instead of using an individual field for the key and data, any valid true/false (Boolean) formula can be used. table( -- searches a database for a value, then returns other information from the same record. Unlike the lookup( function, the *table(* function does not require an exact match. If it does not find an exact match the *table(* function will use the closest match. For example, the *table(* function can look up a tax rate given an income amount, or look up a shipping price given a zip code and weight. uniqueid( -- generates ID codes with a text root and a numeric suffix (for example `Jeff261`). unlockrecord -- unlocks the currently active record. uprecord -- moves the cursor up one visible record.